William Smith was the ninth child and youngest son of Lancelot Smith and Elizabeth Westgarth. I am referring to this William Smith in association with his place of work in order to distinguish him from all the other William Smiths in the family. 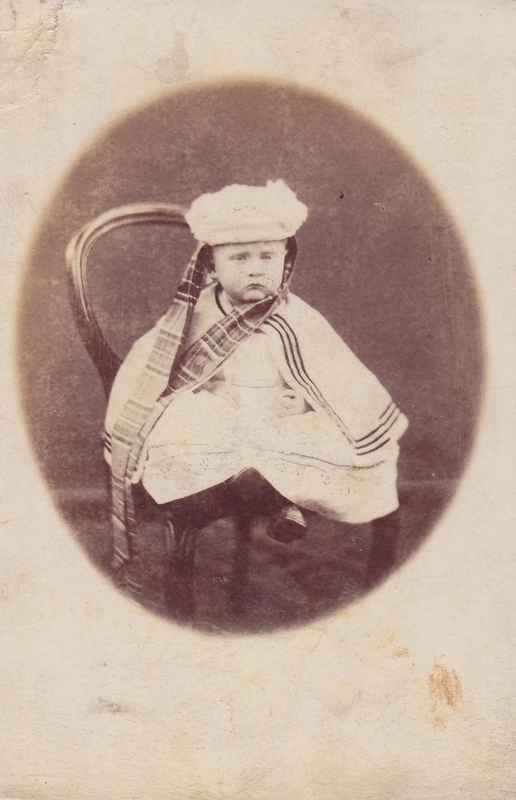 William was born on 9 April 1836 in Gamblesby, Cumberland, and he can be identified in the first two English censuses (1841 and 1851) as living in Gamblesby. In the 1851 census, William is listed as living with his older brother Lancelot, his sister Hannah and his cousin Benjamin Salkeld. William was still at school then. When William’s parents and his brothers and sisters went to live in Ireland on a farm near Cashel, County Tipperary, William may not have gone with them. I believe they left Cumberland in 1852 or 1853, by which time William would have been 16 or 17 years old. I think he probably had got employment by then in the English civil service as a clerk in the offices of Her Majesty’s Customs (HM Customs). Possibly he started his working life in the HM Customs service somewhere nearer home and later moved to work in London. In any case, I don’t think he went to live in Tipperary with the rest of his family although I am sure he visited his family there. 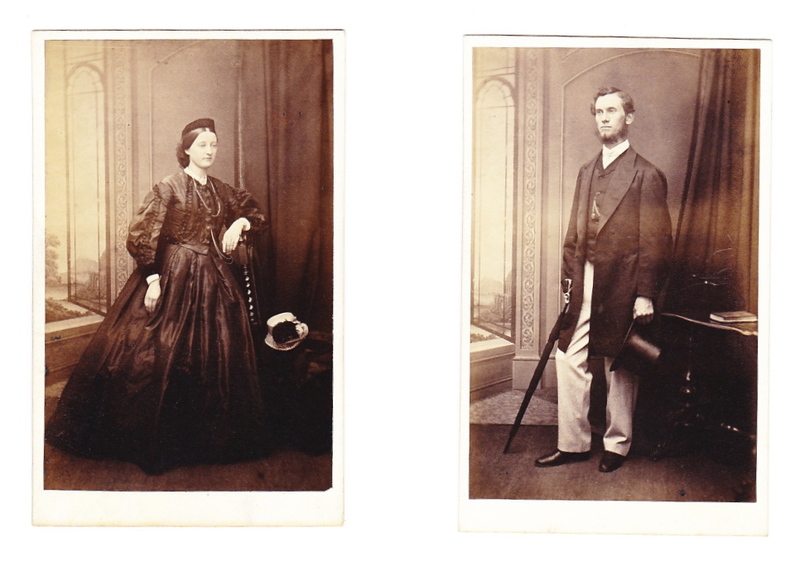 Last year, I was given the above photographs of William and his wife, presumably at the time of their marriage. I was surprised to see on the back of the photographs that they were taken in Dublin. For some time I had been looking, in vain, for William’s marriage in English records. So, looking in Irish records I quickly found that, in September 1864, William married Caroline Brindley in Ballysheehan Parish Church, near Cashel, County Tipperary. Caroline was the eighth of nine children of Thomas and Hannah Brindley. Thomas was a farmer in Ballysheehan, a few miles north-east of Cashel and had been there since about 1850. He was originally from Marple in Cheshire, which is where Caroline was born in 1839. Thomas Brindley was one of the witnesses at the wedding of Hannah Smith and Joseph Backhouse in 1859 so I believe the Brindleys and Smiths were close friends. I assume William visited his family in Cashel and had the opportunity to meet Caroline there. I think the Brindleys were Methodists, like the Smiths. 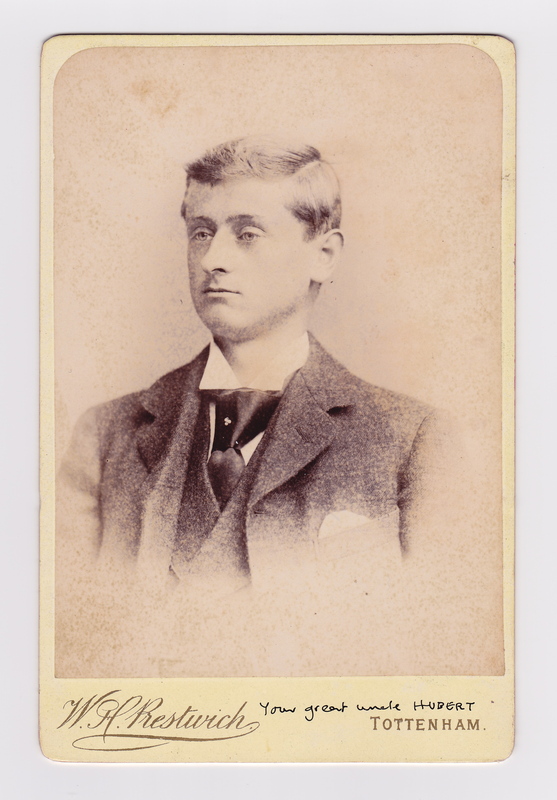 William and Caroline had one son Hubert William, born in Tottenham, Middlesex, on 7 February 1869. In the 1871 census, William, Caroline and Hubert were living in Percy Villas in Tottenham, Middlesex. William’s occupation is listed as “Civil Service Clerk Customs”. Sadly, Caroline died in late 1878, aged only 39, when Hubert was 9 years old. In the 1881 census, William was living in lodgings in Stoke Newington (Hackney) while his son Hubert was in a boarding school in Hastings, Sussex. William’s occupation this time was given as “Clerk HM Customs Old Establishment”. Some time in or after 1885, William’s niece Lizzie Bouskill came to live with him in London as his housekeeper. I believe they moved to a house in Stoke Newington. 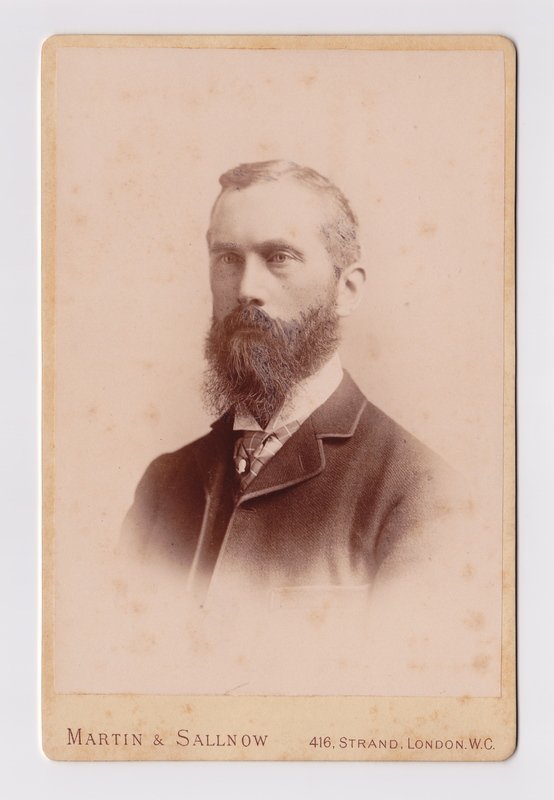 William died in January 1892, aged 56. Strangely, his niece Lizzie Bouskill died before him in September 1891; she was only 23 years old. In the probate records, their address at the time of death was the same: Clyffe, 85 Manor Road, Stoke Newington, Middlesex. 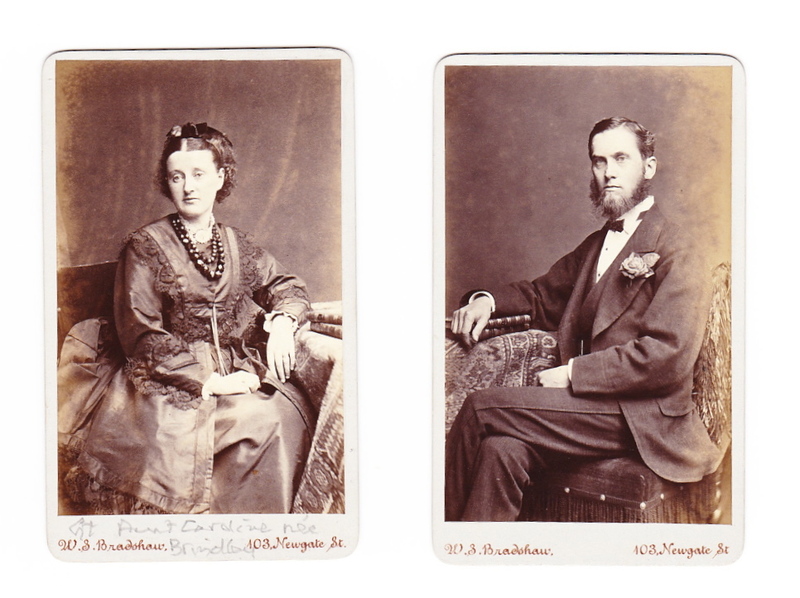 William and Caroline’s son Hubert married Emma Mary Stubbs (known as Daisy) in Walthamstow, Essex, on 6 September 1893. 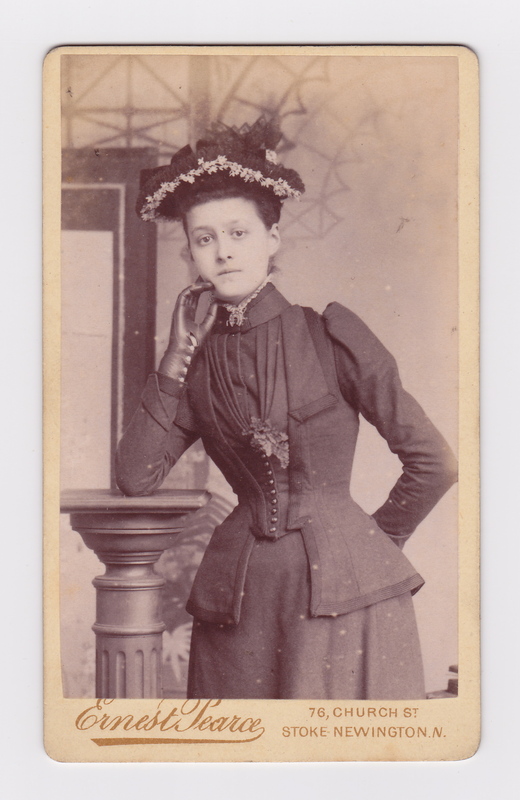 Daisy Stubbs was from Stepney. In the 1901 and 1911 censuses, Hubert’s occupation is given as corn and forage dealer. I have been told he succeeded to this business and I think it may have been inherited from his uncle Cyrus Slater, who was married to Caroline Brindley’s younger sister Eliza. Cyrus and Eliza lived in Cheshire, where he was a corn merchant. (How that business could be transferred to London I am not sure but maybe Hubert learned the trade from his uncle.) It is interesting also that Hubert’s great-uncle Francis Brindley was a prosperous corn merchant and farmer in Grantham, Lincolnshire. Hubert had a hobby as an ivory turner and hard wood turner; a number of his small pieces of the turner’s art are in the family. Apparently he was so good at this craft that he was chosen by the Company of Turners to produce a pair of oval picture frames in ivory as a wedding present to the Duke and Duchess of York in 1923. (The Duke and Duchess later became King George VI and Queen Elizabeth.) Also in 1923, he was admitted to the Freedom of the City of London. Hubert died in April 1954 in Hastings, Sussex. Hubert and Daisy had two daughters, Winifred and Margery, and one son who lived for only a few weeks. 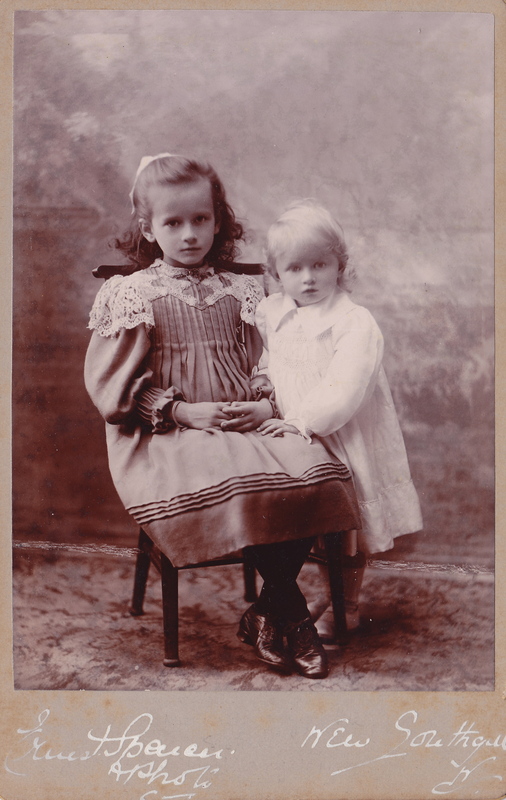 Winifred was born in Southgate, Middlesex, around 1895 and Margery was born, also in Southgate, in late 1899. Unfortunately, Margery died from a fall in 1905, aged 5. Winifred had a long life and was known in the Smith family as Cousin Win. I owe Cousin Win a debt of gratitude because it is her family albums that are the sources for many of the old photographs on this blog. And I am grateful to one of my cousins for kindly passing along the photographs to me. Win married Cecil Heyes in 1924 and they lived in North London before the Second World War. Some time after the War, they moved to Surbiton. They had no children. Win died in 1985 in Kingston on Thames. This entry was posted in Brindley, Photographs, Smith, Tipperary and tagged Hubert Smith, William Smith. Bookmark the permalink.